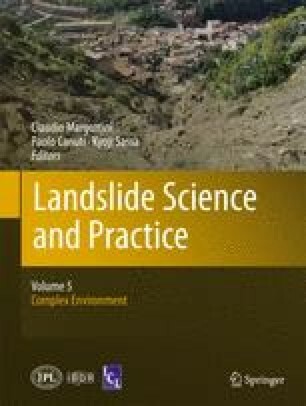 The difficulty in identifying factors controlling the dynamic response of landslide-prone slopes to seismic shaking makes desirable the development of reconnaissance techniques to reveal site resonance conditions that can favour seismically-induced slope failures. Tests were performed to derive information on the occurrence of directional resonance by analysing the azimuthal variations of the horizontal-to-vertical spectral ratios of ambient noise (HVNR) recorded by portable seismometers. In particular, data were acquired in an area of central Italy (Caramanico Terme), affected in the past by seismically-induced landslides, and in two areas of Taiwan (Tsaoling and Jiufengershan), where the 1999 Chi-Chi earthquake triggered giant landslides. The HVNR analysis demonstrated that the presence of a pronounced directional resonance can be recognised from data acquired under different ambient conditions and with different sensors. However, measurement repetitions and uncertainty assessment are fundamental to distinguish persistent features, attributable to site effects, from transient phenomena due to variable ambient conditions.